Glaucoma is a condition in which fluid build-up inside the eye causes damage to the optic nerve, which leads to gradual loss of vision. It is one of the leading causes of preventable blindness in the United States. Glaucoma is much more common with increasing age, diabetes, African-American race, and in patients with a family history of glaucoma. 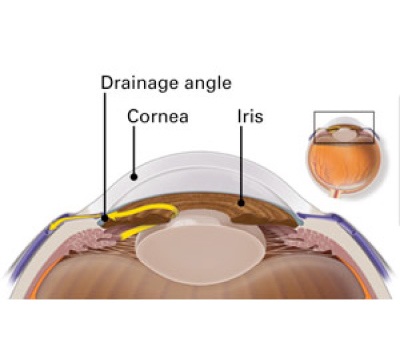 Although the cause of glaucoma is not completely understood, the most common problem is that the fluid produced by the eye does not drain properly due to a blockage in the drainage system. This causes the eye pressure to be higher than normal (>21 mm Hg). Over time, the elevated eye pressure damages the optic nerve in the back of the eye. When the nerve becomes damaged, first the peripheral (side) vision is lost. If the high pressure remains untreated over time, the central vision is also lost, leading to blindness. Glaucoma has no symptoms until the disease is advanced. This is why routine eye exams to screen for glaucoma are so important. At Kozlow Eye, a screening eye exam includes measurement of the eye pressure. The optic nerve is then carefully examined by Dr. Kozlow for signs of glaucoma damage. If any signs of glaucoma are present, further screening tests will be recommended. The testing for glaucoma includes visual field examination, optical coherence tomography (OCT) of the optic nerve head, and measurement of the corneal thickness. A visual field test measures how complete the side vision is. The patient sits in a machine with a large white dome. With one eye at a time, the patient looks at the central light and pushes buttons when lights are presented off to the side. OCT involves taking computerized pictures of the optic nerve and comparing them to other patients of the same age and gender. Measuring the corneal thickness helps Dr. Kozlow better interpret the eye pressure. The treatment options for chronic open angle glaucoma most commonly include eye drops or laser treatment to reduce the eye pressure. Medicated drops are placed in the eye up to 4 times daily to lower the eye pressure. Because glaucoma cannot be cured, the drops are required on a long-term basis. The laser treatment, known as selective laser trabeculoplasty (SLT) uses a gentle laser to increase the drainage of fluid out of the eye, therefore lowering the eye pressure. The treatment is painless and can be done in the office. SLT is a safe and effective alternative to medications and offers a long-term treatment for glaucoma. Acute angle closure glaucoma is a much less common form of glaucoma. It causes sudden pain in the eye, blurred vision, nausea and vomiting. If untreated rapid loss of vision occurs. The definitive treatment uses a laser to place a microscopic hole in the colored part of the eye (iris), which breaks the attack and immediately lowers the eye pressure. 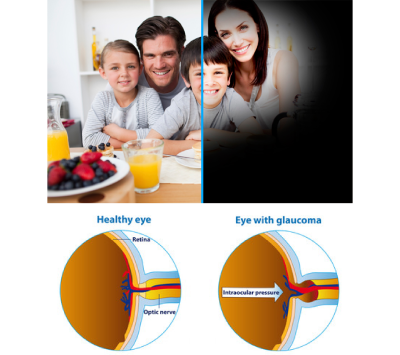 Visual loss from glaucoma is preventable with early detection and treatment. Once glaucoma is diagnosed, the eyes should be monitored every 4-6 months. Kozlow Eye offers the most advanced forms of glaucoma screening and management to help you preserve your vision.